Kids are not always realistic. They believe anything is possible—Santa Clause, the Tooth Fairy, and saving the world. Adults don’t believe in such things. So, it was a good thing for thousands of homeless children that Zach Bonner was just a gullible kid. In 2005, at only seven years of age, he became the youngest person ever to establish a 5013C non-profit foundation. He began Little Red Wagon Inc. to relieve the suffering of the homeless; particularly the children. “These kids don’t have a home, they don’t have a safe place to sleep at night. They’re out on the streets not because they want to be, but because it’s out of their control,” he said. Zach is not what you call a “high achiever” because it was never about achievement. He acted out of compassion for others and today, at the age of fifteen, he continues the fight. The movie, Little Red Wagon, portrays the real life story of Zach Bonner. In 2004, after he survived unscathed from Florida’s Hurricane Charley, Zach learned that tens of thousands had lost their homes. Wanting to relieve their suffering, he took his little red wagon around the neighborhood, gathering for the relief effort. From such a beginning, Zach’s awareness of homelessness expanded. He could not ignore the suffering across the country of those who were homeless due to poverty. As adults, we are all aware of the problem of suffering, but for Zach, his childish indignation melded with a determination that he could make a difference. He already had made a difference collecting donations in his little red wagon and he had no intention of stopping. The movie Little Red Wagon, would seem almost too far-fetched if it was not true. For proof, go to Zach’s bio page and listen to his passionate plea to for people to make a difference in the lives of others. (Go to the 6-minute mark to hear his passion.) Little Red Wagon goes beyond family entertainment with a mission to inspire each of us, to go beyond what we thought we were capable of doing. “When your room gets messy and it becomes too big of a problem, you shut the door and ignore it,” Zach says in the movie. “But closing the door doesn’t make the problem go away. If you just get started with a little part, it does not seem so overwhelming and it begins to make a difference.” And with such a down-to-earth perspective, people responded and donations poured in to help relieve what most of us feel is an overwhelming problem. Little Red Wagon is produced by The Philanthropy Project, a non-profit initiative funded by the John Templeton Foundation. It was produced by three-time award-winning Dr. Michael Guillen. Zach (Chandler Canterbury) is supported in his efforts by his mother (Anna Gunn) and older sister (Daveigh Chase). Initially, the three collected over twenty-seven truckloads of supplies for the hurricane victims. As his compassion grew so did his activism. Zach came up with the idea of backpacks– “Zach Packs” for homeless children, filled with basic necessities plus, a toy. From there, he continued to raise money, put on a Christmas party for the homeless and then, he took his mission on the road. Zack began raising money and awareness by walking from his hometown of Tampa, Florida to Tallahassee with his mother at his side and his sister driving a support vehicle. The film ends at the end of the first walk to raise money and awareness, but the story continues to this day. At the end of the movie are photographs and information about his other walks, which took him across the country. 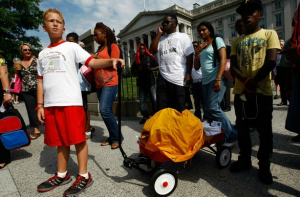 In 2009 he walked from Atlanta, GA to the capitol Washington, DC, and in 2010, Bonner walked from 2,478 miles from Tampa to Los Angeles in six months. This is a movie for the entire family. Not only does it have the power to dampen the undeserved importance of childish interests such as video games, but it also serves notice to adults: There’s a big world out there, get out in it and dig in! Given that a mere child made such a difference, it leaves no room for excuses. Little Red Wagon, rated PG, opens October 5 in select theaters.